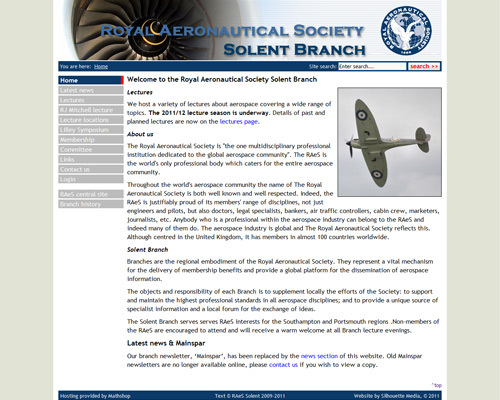 Solent RAeS required a site that had a similar look and feel to the main Royal Aeronautical website whilst maintaining their own distinct image. (Note that the main Aeronautical society website has since changed design.) They needed to be able to update the site regularly with details of the latest lectures and news. The society is currently planning to expand the user base of the CMS to allow Southampton University students contribute news and other site content too. 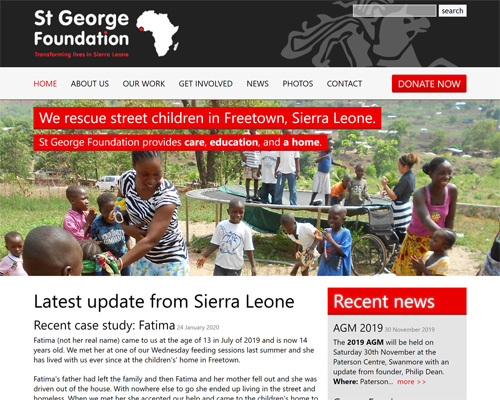 As a rapidly expanding charity providing a home and education to street children in Sierra Leone, the St George Foundation needed an easy to use and easy to update website which would fit in seamlessly with their existing branding. We worked closely with the charity to develop a site that allowed them to promote their cause and encourage donations. We continue to provide any support the charity needs meaning they can focus on their charitable work in the knowledge that their web presence is in safe hands. 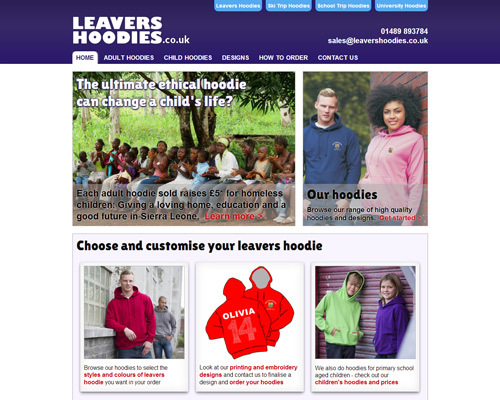 The brief for the Leavers Hoodies site was that it should be clear and easy to use, giving ready access to all the products available without complex menus or dialogues. The final design has a pleasingly crisp design with all information available with a minimum number of clicks. As with all our websites the design is unique and we manage all the complexities of hosting the website with our own content management system, making our websites simple and easy to update. 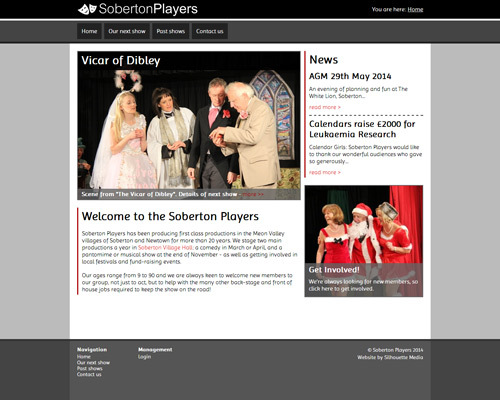 As with many of our customers Soberton Players didn't have an existing brand to base their website around. However this was no problem - we worked with Soberton Players to build up a look for their new website and even designed a new logo for them. Soberton Players were particularly keen to have an area of their website where they could display galleries of photos of past shows. Using our galleries plugin we were able to provide a really easy to use online photo gallery which integrates seamlessly into the rest of the site. 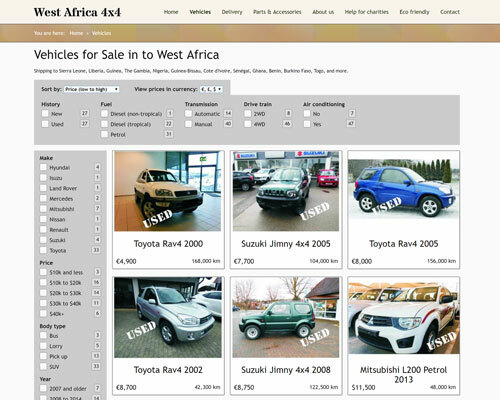 West Africa 4x4 (formerly Sierra Leone 4x4 Vehicle Sales) wanted a "clear and simple" website design where they could list the vehicles they have in stock, with filtering and sorting capabilities. They needed to have a system where they could regularly add new vehicle listings and easily upload photos of each vehicle. We created a new bespoke plugin featuring a vehicle list with information pages for each vehicle they added. The plugin allows them to give as much or little information of each vehicle as they require, quickly and easily, and is easily customisable to adapt to business changes. After the success of the 4x4 sales website, we were also commissioned to design a new website for their sister company Sierra Leone Car Hire. Soberton Parish Council wanted a fairly simple template design. It was important that the site wouldn't be too busy and overcomplicated. 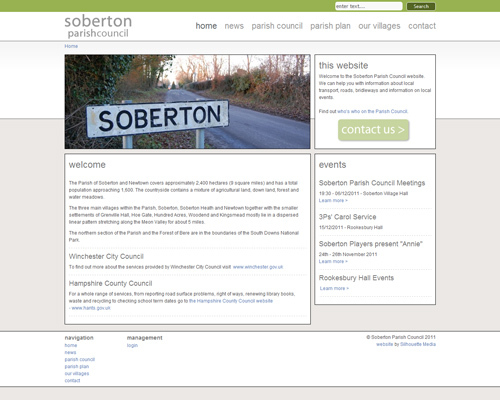 We consulted with Soberton Parish Council several times during the template design period, and uploaded all the initial site content from documents and images they gave us. We also visited to give several short tuition sessions on how to use the content management system before and soon after the site was launched.